Back in November I posted about my goal to become fluent in Italian in the next year and a half. Once I put it out there, I began studying feverishly to make it happen, using all the tools and courses available on the internet. I’ve found that you can make pretty good progress learning a language this way, if you are really committed. By early January I had a couple thousand words under my belt, had learned three verb tenses and some other basic grammar, and could even understand a fair amount of spoken Italian. However, I couldn’t speak Italian at all. And I knew that to get to the next level, I was going to have to put myself in a situation where I was forced to speak. I needed to study in Italy. With work commitments and kids at home, the most time I could get away was a week. With Ed’s blessing I started planning a trip. 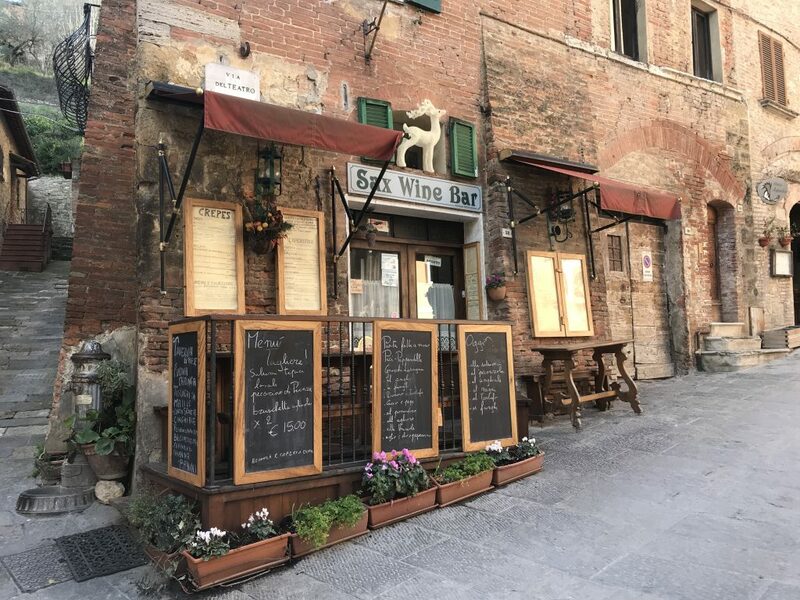 After researching language schools I chose to spend five days studying at Il Sasso Scuola di Italiano in Montepulciano, a lovely Tuscan town best known for its red wine. To make the immersion complete, I also opted to stay with an Italian woman who speaks no English. 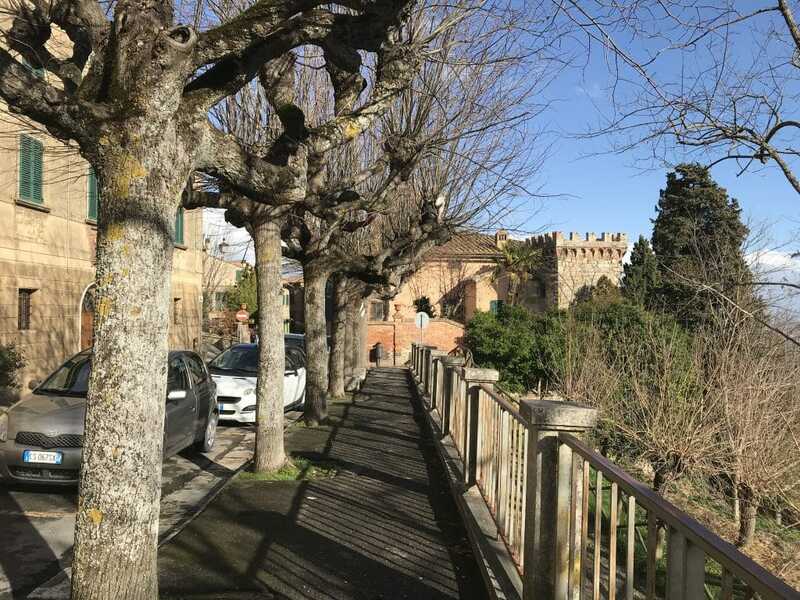 Fiorella is a widow in her 60s, has lived in Montepulciano all her life and hosts Il Sasso students for the very reasonable fee of 40 Euro/night, which includes breakfast and dinner. 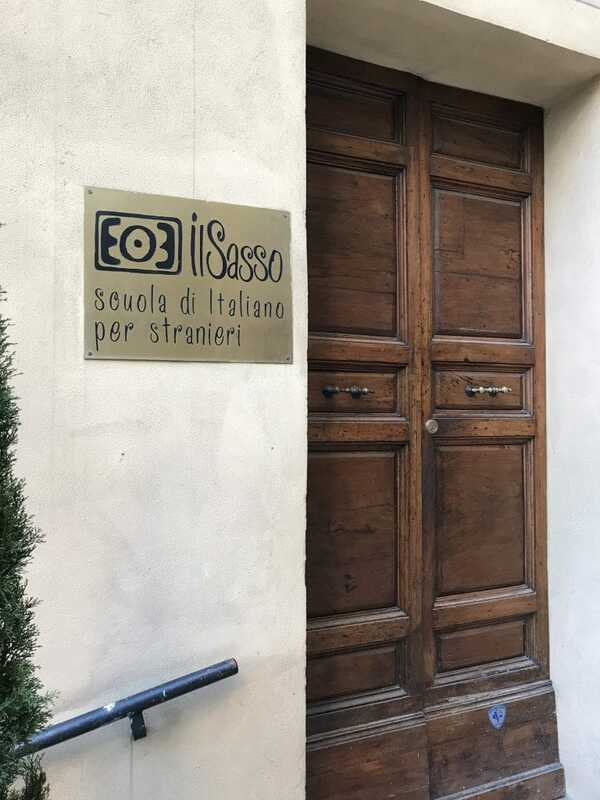 If you study at Il Sasso you can also choose to stay in a furnished apartment (which the school will arrange) or a hotel. The hotel option was tempting, but I decided to go all in and make it a full immersion. I flew into Florence via Munich and had the next morning to walk around Florence before catching the train to Chiusi. I’ve been to Florence a couple of times and seen all the must-see sights, so there wasn’t anything I needed to see or do. I just wanted to walk around and soak it all up. I was lucky enough to have a beautiful day. Sunny and clear, with very few tourists. I arrived at the train station early, to make sure I didn’t screw up and end up on a train to Rome. To be on the safe side, I had bought my ticket online ahead of time, so all I had to do was board the train and go. Just as the train was about to depart I heard an announcement that all passengers needed to have their tickets validated by the obliteratrice (validating machine) on the platform, or be fined 100 Euro. Afraid to get off and risk missing the train, I decided to stay put and plead ignorance when the conductor came around. As it turns out, e-tickets are exempt from the validating requirement, so I was safe. I made a mental note to remember the obliteratrice when I bought my return ticket. From Chiusi I had to take a 45 minute bus ride to Montepulciano. I was dropped at the bottom of the hill just before 5:00 pm. 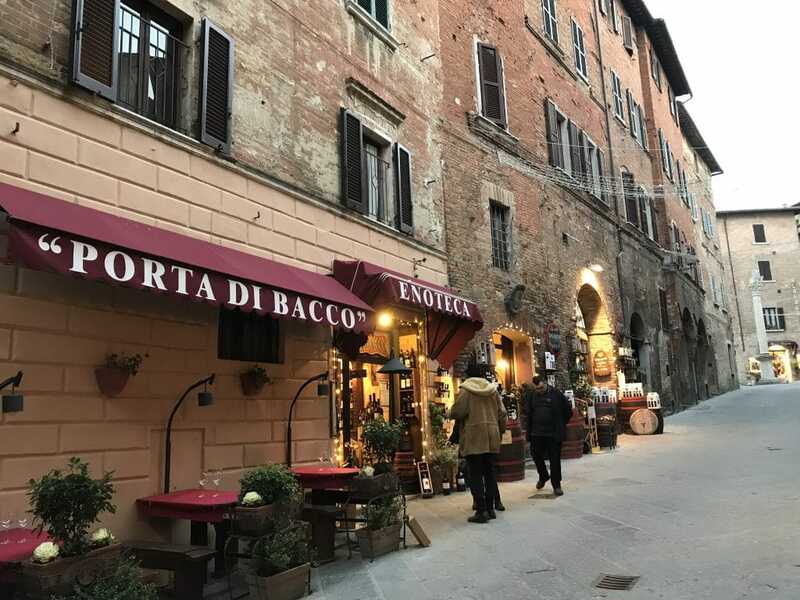 The town of Montepulciano is charming any time of day but in the twilight it was positively magical. The warm glow of lights in the clear crisp January air made me glad this was home for the next week. 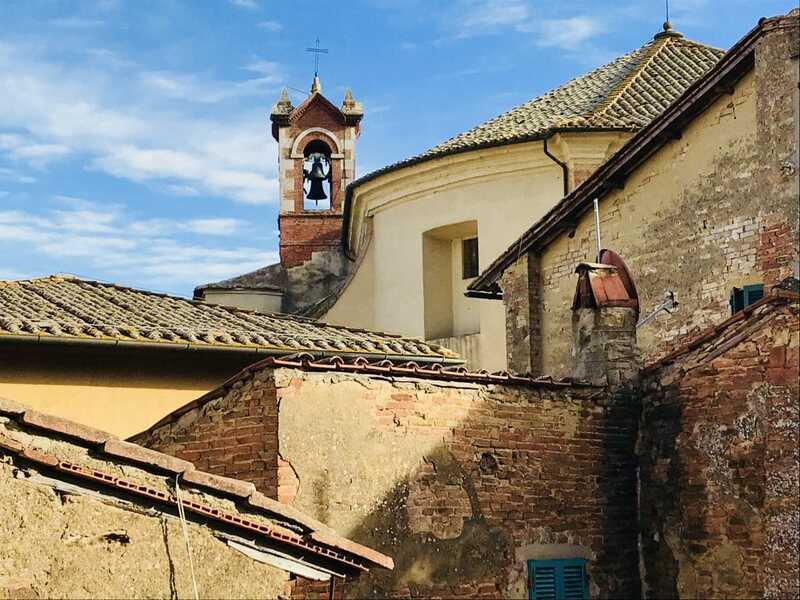 I plugged Fiorella’s address into my phone and started the slog straight uphill into town, dragging my suitcase behind me and wishing I’d left my laptop at home. I finally found her house and was greeted by her dog, Gnauf (Nee-owf) as I hauled my stuff up the stairs. Exhausted, jet-lagged and hungry, all I wanted was to have a nice lie-down, but my immersion wouldn’t wait. Fiorella welcomed me enthusiastically (in Italian) and peppered me with questions about my trip, my family and why I wanted to study Italian. There was no avoiding it. I had to start speaking Italian, since Fiorella speaks no English (or if she does, she didn’t let on). 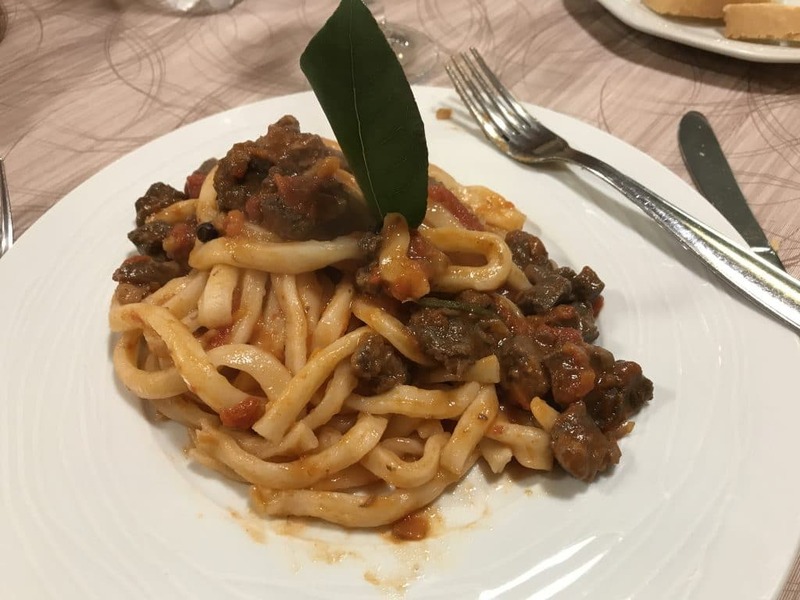 I sipped some of the local vino nobile and watched her throw together a delicious meal of homemade pici with ragu, followed by roast chicken and salad. Pici (pronounced peechee) is the typical pasta of that part of Tuscany. It’s made by rolling pieces of dough into long worms (like we used to do with Play-doh in kindergarten). Fiorella has had lots of students stay with her, so she was patient with me as I bumbled along telling her about myself and asking her questions in Italian. Finally, sensing I needed a break, she turned on the TV to an Italian game show with a bizarre format that I couldn’t for the life of me figure out. By the end of the week, though, I started to get the gist. Next morning I had to be at school by 8:30 to take a written and oral “placement test” to see what level I should be at. The written test started out with very basic questions and got progressively more difficult. I was only able to complete about two thirds of it. The school day went from 9:00 -1:00 and was divided up into two parts, with Costanza teaching one part and Alberto teaching the other and a cappuccino break at a nearby bar. Based on my evaluation they decided that I needed to work on the conditional tense followed by the present subjunctive and double pronouns. There is no English spoken at the school…everything is explained in basic Italian and using a white board. They keep things moving along with various types of written and oral exercises, with heaviest emphasis on speaking and conversation. We also spent time learning about the history, culture and cuisine of the region, which I found fascinating. For example, I learned that the reason the Tuscan landscape looks the way it does now is because of La Mezzadria. La Mezzadria was a medieval sharecropping system dating back to the 14th century and lasting until the 1960s. The way the system worked was that a landowner (padrone) would divide up his property into numerous farms (podere) of 10-30 acres, to be worked by a farmer (contadino) and his family. Each farm was self-sufficient, with the contadino raising vegetables, wheat, chickens cows, olives and grapes on his plot of land. Each year he paid the landowner 50% of what he grew. I had my afternoons free, which started with a relaxing lunch at one of the restaurants in town. My favorite was La Pentolaccia, a small place owned and run by two friendly sisters. The food was great and it was always full at lunchtime. After lunch I spent a lot of time exploring the town. Given the time of year many of the shops were closed for the winter or only open limited hours. While I was disappointed not to have more opportunities to interact with the local merchants, the plus side was that I saved a lot of money I might otherwise have spent on leather goods. 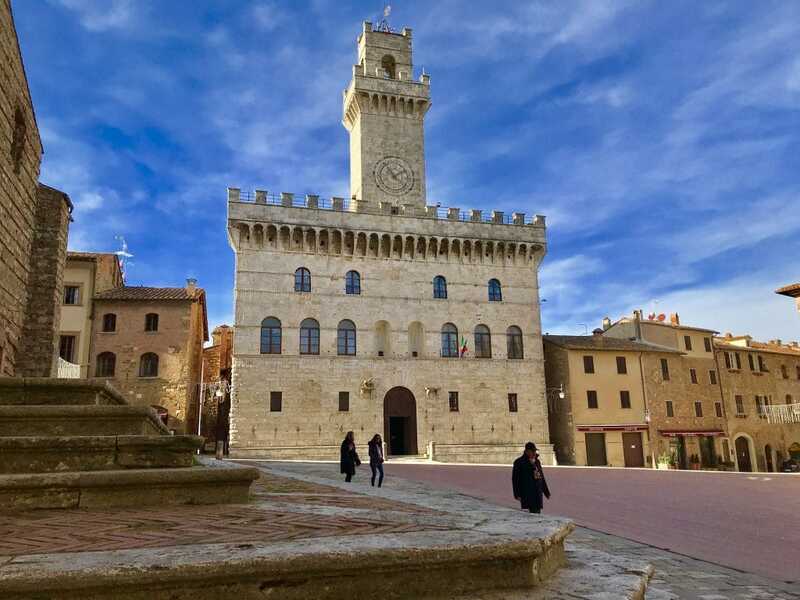 I did attend a wine-tasting one afternoon and ended up buying a case of Vino Nobile di Montepulciano to ship home to Ed. I spent another afternoon at the movies (no subtitles) where the plot was lost on me. Apparently my Italian has not progressed far enough that I can understand it spoken at normal speed. 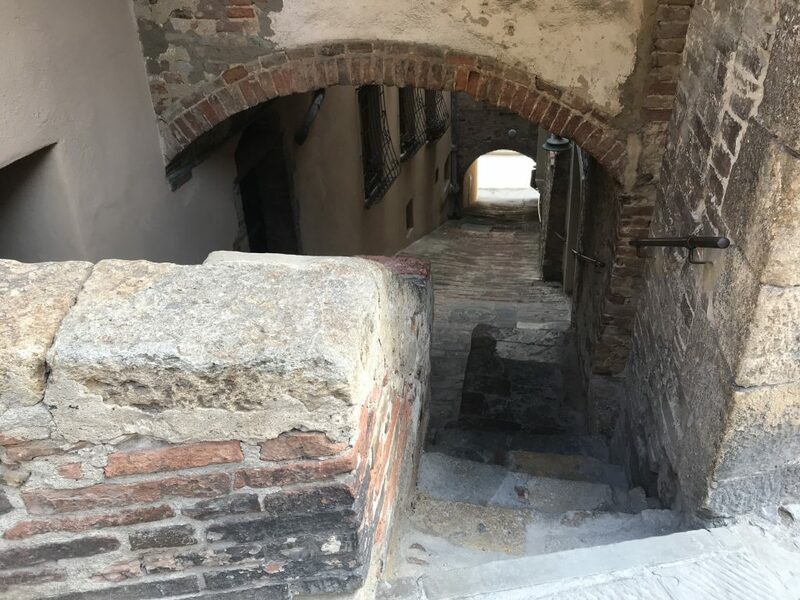 The various levels of the hill town of Montepulciano are connected by narrow passageways and stairs. 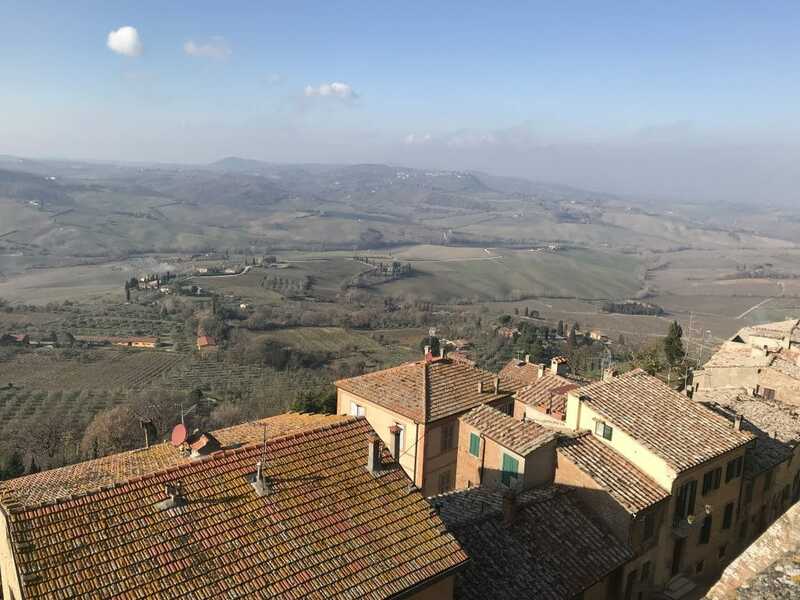 Once home I tried to assess how much the week in Montepulciano helped me in my quest to become fluent and whether it was worth it to travel all the way to Italy to study for a week. I learned some new grammar, to be sure, and Costanza and Alberto were VERY good teachers. But the big benefit was that I got an opportunity to speak…a lot, which is what I wanted and needed. I had extensive conversations on a whole range of subjects, both with my teachers and with Fiorella. This is something you normally don’t get to do as a tourist because your interactions tend to be limited to ordering in a restaurant or buying something in a shop. So I’d say my immersion week was definitely worthwhile. I only wish I could have stayed longer and I hope I can do it again because there’s only so much you can accomplish in a week of class. Whether I will go back to Il Sasso or try a different school (maybe closer to our home in Le Marche) is something to ponder. I’m curious. Who else has studied at an Italian language school in Italy? How did it go? Would you recommend it?